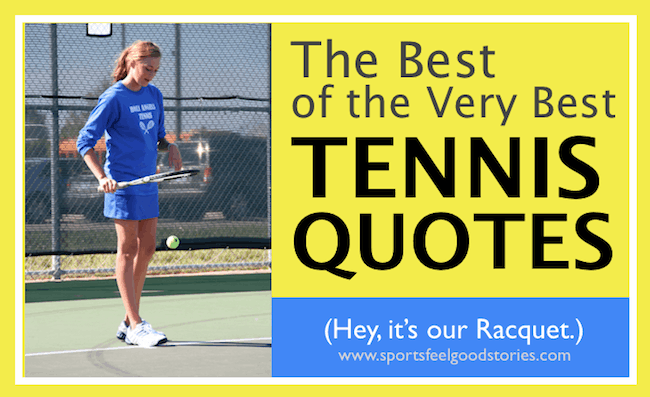 Looking for some inspiring tennis quotes to get your tennis team fired up for a match? Our collection of tennis sayings will inspire, motivate and entertain. To err is human. To put the blame on someone else is doubles. Love is nothing in tennis, but in life it’s everything. Tennis is a tough sport – there are no draws. But if there was one, I would have been happy to accept a draw with Rafa tonight, really. I would have said a great event would be quarters…Fourth round would be nice. I hope to see you next year. If not, this was a wonderful run here, and I can’t be more happy to have won here tonight. He did not surprise me. He was playing aggressively, and I understand that in a match against me. I don’t think it would have been intelligent to try to get into too many long rallies from the baseline. I don’t think he would have won. He went for it, and it was the right thing for him to do. Being honest, in these kinds of matches I won a lot of times against him. Today he beat me, and I just congratulate him. If I were to say, ”God, why me?” about the bad things, then I should have said, ”God, why me?” about the good things that happened in my life. What a polite game tennis is. The chief word in it seems to be “sorry” and admiration of each other’s play crosses the net as frequently as the ball. Tennis belongs to the individualistic past – a hero, or at most a pair of friends or lovers, against the world. When I was 40, my doctor advised me that a man in his 40s shouldn’t play tennis. I heeded his advice carefully and could hardly wait until I reached 50 to start again. But that won’t give me a free hand to hold the beer. Tennis is not a gentle game. Psychologically, it is vicious. That people are only just beginning to come to terms with this fact illustrates just how big a con trick has been perpetrated on the non-playing tennis public – and even a few players, usually losing players – for decades. I told myself to play free. You play the ball. You don’t play the opponent. Be free in your head. Be free in your shots. Go for it. The brave will be rewarded here. If you can react the same way to winning and losing, that’s a big accomplishment. That quality is important because it stays with you the rest of your life, and there’s going to be a life after tennis that’s a lot longer than your tennis life. I fear no one, but respect everyone. An otherwise happily married couple may turn a mixed doubles game into a scene from Who’s Afraid of Virginia Woolf. The next point — that’s all you must think about. What is the single most important quality in a tennis champion? I would have to say desire, staying in there and winning matches when you are not playing that well. It’s one-on-one out there, man. There ain’t no hiding. I can’t pass the ball. Golfers are forever working on mechanics. My tennis swing hasn’t changed in 10 years. The cunning competitor plays on the other party’s guilt. Continuously praise your opponent’s shots, and you’ll notice how he begins to press. Self-beratement also serves to balance a guilty conscience for being successful and makes your opponent disturbed for upsetting you so. If on occasion you call one of your opponent’s “out” shots “in,” then later on you can innocently call an “in” shot “out” on a crucial play. Practice saying “Good try,” sincerely; then you can call a lot of close shots “out” and get away with it. Some people say I have attitude — maybe I do — but I think you have to. You have to believe in yourself when no one else does – that makes you a winner right there. At least ten times before your serves. These tennis expressions are great for Instagram and Facebook captions. Send us your favorite tennis quotes and we may add them to our collection. Shoot us an email with the subject heading “tennis quotes.” Thanks. Check out our Tennis Slogans — Great for apparel, Facebook headlines, Instagram captions, a rally cry, a banquet program and more.